libmraa contains helpful bindings for addressing hardware on Intel Galileo and Edison that work in a variety of languages. In this tutorial we will use a python script to make an LED blink. You will need an Intel Edison, a way to connect to it (e.g. a Base Block), and access to some GPIO pins (e.g. 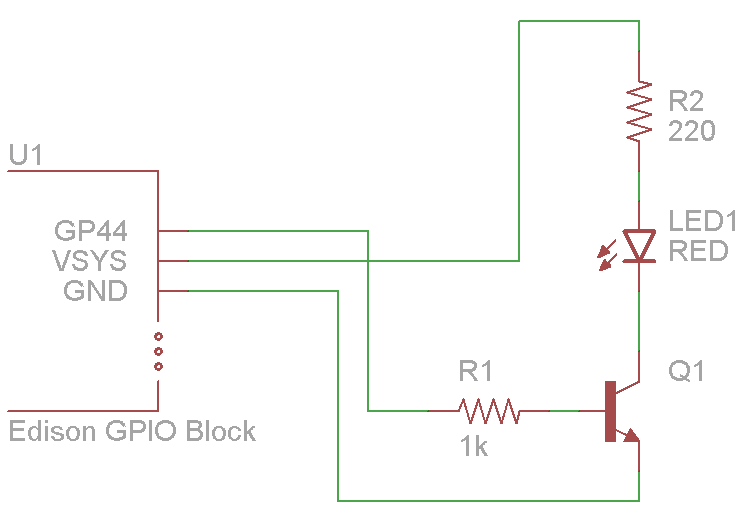 a GPIO Block). You need to have Ubilinux, a version of Debian, running on your Edison. You can do that by following this tutorial. The first thing to do is connect up the LED. 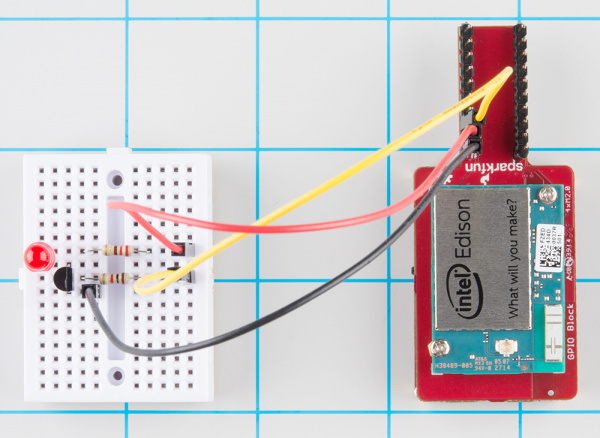 For this tutorial, we used an Intel Edison, a Base Block, and a GPIO Block. 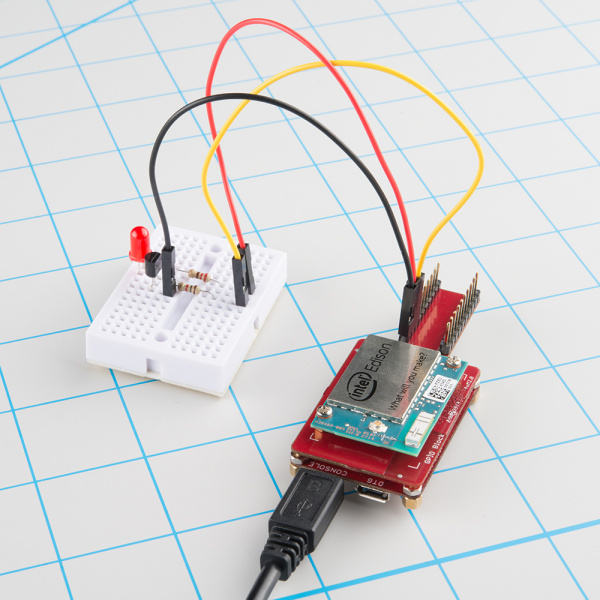 You can also use the Console Block, Mini Breakout Board, or Arduino Breakout Board. In addition to the Edison and breakout board(s), you will need some basic components. Below is the list of components used in this tutorial. Note that from the resistor kit, we used a 1 kΩ and 220 Ω resistor. Unless you are using the Edison Arduino Breakout board, the Edison cannot supply enough current to fully (and safely) light an LED. As a result, we need to make a basic switch using a BJT transistor. Note: If you are using the Arduino Breakout Board, you do not need to use this circuit, as the Arduino board can provide enough current. You will want to use the pin labeled A0, as noted in Table 3 of the Arduino Breakout Hardware Guide. Also Note: if you are using the Mini Breakout Board, you will want to use GP44 (J19, pin 4) according to the Breakout Board Hardware Guide. Connect your LED circuit to the GPIO Block as shown. Important: Note the direction of the LED and transistor! In the photo, the flat edge of the LED is pointing down (towards the transistor), and the flat edge of the transistor is pointing to the right (towards the resistors). apt-get update will update your local cache of all currently available packages in the repository. The first dependency of this install is the PCRE development files. Looks like the right thing. Important: Make sure you run the final command, "make install" with root or "sudo." That DBUILDSWIGNODE flag turns off node.js support, which isn't available in the version of swig in apt. If you need node.js, you can compile a newer version of swig from source (3.01+). You should see that the libraries have been included in the cache. 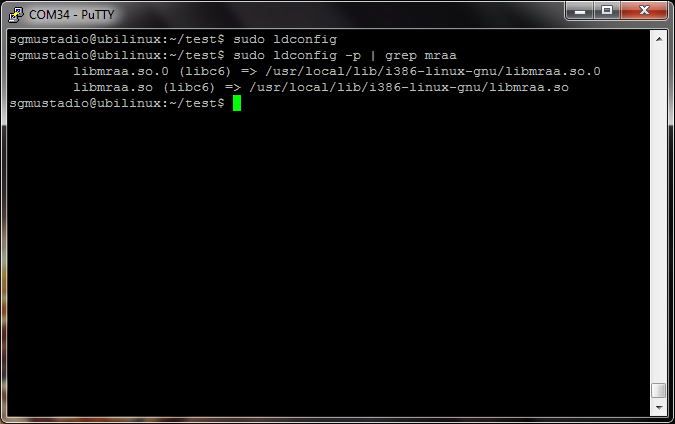 Note that this command lets us use the mraa module for this terminal session only. If we restart the Edison, we will have to retype the command. Scroll all the way down to the bottom of the file, and add the command from above in a new line. 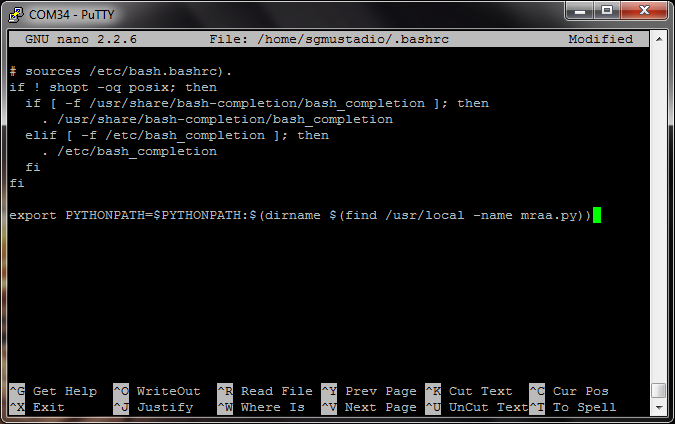 The bottom of your .bashrc file should look like the screenshot below. Save and exit ('Crtl-x' and 'y' with nano). This part is also optional. If you installed sudo, you might notice that PYTHONPATH is not updated properly when you try to run a Python script with "sudo." For example, you might get an error like "ImportError: No module named mraa." Your sudoers file should look like the screenshot below. Save and exit ('Crtl-x' and 'y' with nano). Reboot your Edison for this to take effect. Important: You need to run blink as root! If you get an error such as “Invalid GPIO pin specified” or "FATAL error, libmraa program must be run as root (EUID 0), cannot proceed" it means that you do not have permissions to modify GPIO. 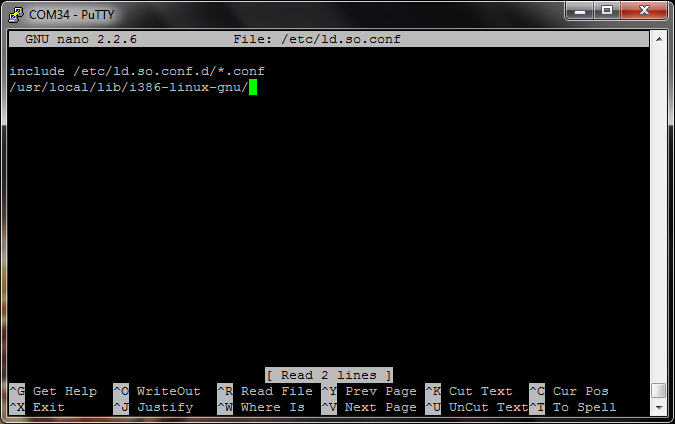 Either switch to root using the “su” command or run the command with “sudo” (if you have “sudo” installed). You should see your LED start turning on and off! Save and exit the file (if you are using nano, press 'Crtl-X' and 'y'). Important: You need to run blink.py as root! If you get an error such as "ValueError: Invalid GPIO pin specified" it means that you do not have permissions to modify GPIO. 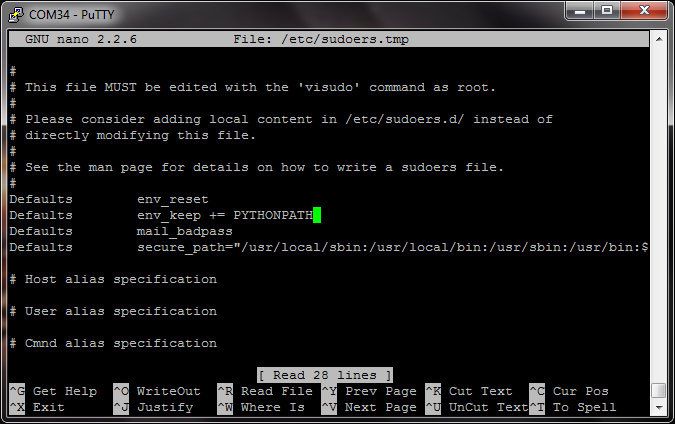 Either switch to root using the "su" command or run the command with "sudo" (if you have "sudo" installed). Probably not the first time you've made an LED blink, but maybe the first time in python on Debian! You might have noticed that we used GP44 in hardware and GPIO 31 in our example code. This is because the mraa library uses a different number for the pins. If you would like to use mraa to control hardware, figure out which GPIO pins you plan to use on the table below (labeled "Edison Pin") and then use the MRAA Number in software. Note that the "Edison Pin" numbers are the same GPIO pin numbers found on Linux in the Edison. They are also listed on the GPIO Block. The "Pinmode" allows you to change the function of each pin.